When rugs are being cleaned, they are first beaten to remove all dust and loose dirt and then sprayed with high pressure detergent to loosen and suspend soil and spots. They are then gently scrubbed with additional emulsifiers after which they go through a triple rinse system to rinse out all soil. Next, the rugs go into a huge wringer to squeeze out the water. Finally, the rugs move onto a conveyor where they go up into the dry room where ozone removes all odors. When the rugs come down they're all dry and fresh smelling. The last step is any fringe, which must be cleaned by hand to whiten it to its original color. The rugs are wrapped in rodent- and insect-proof paper and ready for delivery or pick-up. We at Boushelle Rug are proud to be the biggest and best at what we do. And we're happy to offer tours of our plant to show our customers the complete rug cleaning process. General Boushelle has been cleaning oriental and custom rugs since 1903, and cleaning rugs is how we got started in the flooring business. The backbone of our company is our 19 foot wide, 70 foot long, and three stories tall area rug cleaning machine. Our machine is housed in a building that was specifically built around it due to its enormous size. To effectively clean area rugs, we first remove all dust and loose dirt, and proceed by spraying high pressure detergent to loosen and suspend soil and spots. The rugs are then gently scrubbed with additional emulsifiers before going through a triple rinse system to rinse out all existing dirt. The next step in our cleaning system is to wring out all water and move the rugs down the conveyor, in which they are brought upstairs into our dry room. After eight hours of regulated heat, the rugs are brought down from the dry room. The last step in our process is to clean all fringes by hand (to maximize their original colors), brush out the fringes to remove any tangles, and then to vacuum all rugs to ensure that no loose dirt or hair was left in the fibers. We do offer plastic wrap at an additional charge if needed for storage purposes. Otherwise, we wrap all rugs in rodent and insect-proof paper. At General Boushelle, we take pride in our system and are proud to be the biggest and best at what we do. 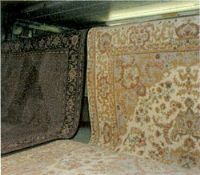 We are happy to offer tours of our facility to show customers the complete rug cleaning process.